By Álvaro Díez - PhD candidate, Piotr Małek and Mateusz Mucha. Have you ever wanted to calculate the distance from one point to another, or the distance between cities? Have you ever wondered what the distance definition is? We have all these answers and more, including a detailed explanation of how to calculate the distance between any two objects in 2D space. As a bonus, we have a fascinating topic on how we perceive distances (for example as a percentage difference); we're sure you'll love it! 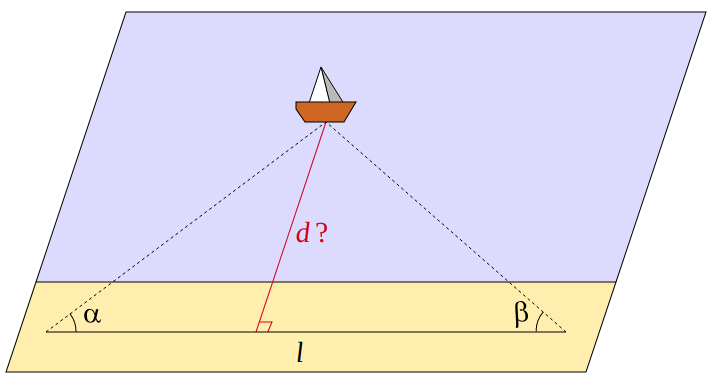 Before we get into how to calculate distances, we should probably clarify what a distance is. The most common meaning is the 1D space between two points. This definition is one way to say what almost all of us think of distance intuitively, but it is not the only way we could talk about distance. You will see in the following sections how the concept of distance can be extended beyond length, in more than one sense that is the breakthrough behind Einstein's theory of relativity. If we stick with the geometrical definition of distance we still have to define what kind of space we are working in. In most cases, you're probably talking about three dimensions or less, since that's all we can imagine without our brains exploding. For this calculator, we focus only on the 2D distance (with the 1D included as a special case). If you are looking for the 3D distance between 2 points we encourage you to use our 3D distance calculator made specifically for that purpose. To find the distance between two points, the first thing you need are two points, obviously. These points are described by their coordinates in space. For each point in 2D space, we need two coordinates that are unique to that point. If you wish to find the distance between two points in 1D space you can still use this calculator by simply setting one of the coordinates to be the same for both points. Since this is a very special case, from now on we will talk only about distance in two dimensions. The next step, if you want to be mathematical, accurate, and precise, is to define the type of space you're working in. No, wait, don't run away! It is easier than you think. If you don't know what space you're working in or if you didn't even know there is more than one type of space, you're most likely working in Euclidean space. Since this is the "default" space in which we do almost every geometrical operation, and it's the one we have set for the calculator to operate on. Let's dive a bit deeper into Euclidean space, what is it, what properties does it have and why is it so important? The Euclidean space or Euclidean geometry is what we all usually think of 2D space is before we receive any deep mathematical training in any of these aspects. In Euclidean space, the sum of the angles of a triangle equals 180º and squares have all their angles equal to 90º; always. This is something we all take for granted, but this is not true in all spaces. Let's also not confuse Euclidean space with multidimensional spaces. Euclidean space can have as many dimensions as you want, as long as there is a finite number of them, and they still obey Euclidean rules. We do not want to bore you with mathematical definitions of what is a space and what makes the Euclidean space unique, since that would be too complicated to explain in a simple distance calculator. However, we can try to give you some examples of other spaces that are commonly used and that might help you understand why Euclidean space is not the only space. Also, you will hopefully understand why we are not going to bother calculating distances in other spaces. The first example we present to you is a bit obscure, but we hope you can excuse us, as we're physicists, for starting with this very important type of space: Minkowski space. The reason we've selected this is because it's very common in physics, in particular it is used in relativity theory, general relativity and even in relativistic quantum field theory. This space is very similar to Euclidean space, but differs from it in a very crucial feature: the addition of the dot product, also called the inner product (not to be confused with the cross product). Both the Euclidean and Minkowski space are what mathematicians call flat space. This means that space itself has flat properties; for example, the shortest distance between any two points is always a straight line between them (check the linear interpolation calculator). There are, however, other types of mathematical spaces called curved spaces in which space is intrinsically curved and the shortest distance between two points is no a straight line. 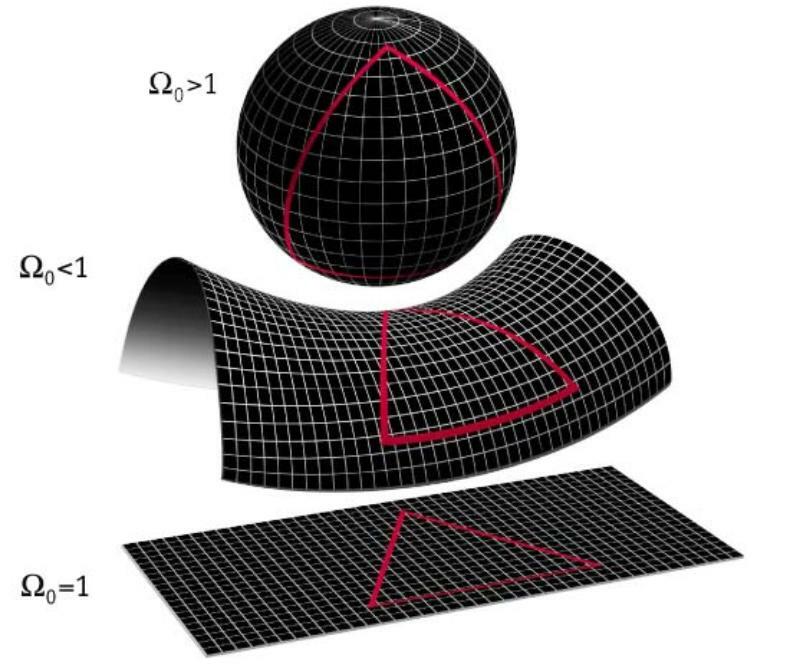 This curved space is hard to imagine in 3D, but for 2D we can imagine that instead of having a flat plane area, we have a 2D space, for example, curved in the shape of the surface of a sphere. In this case, very strange things happen. The shortest distance from one point to another is not a straight line, because any line in this space is curved due to the intrinsic curvature of the space. Another very strange feature of this space is that some parallel lines do actually meet at some point. You can try to understand it by thinking of the so-called lines of longitude that divide the Earth into many time zones and cross each other at the poles. It is important to note that this is conceptually VERY different from a change of coordinates. When we take the standard x, y, z coordinates and convert into polar, cylindrical, or even spherical coordinates, but we will still be in Euclidean space. When we talk about curved space we are talking about a very different space in terms of its intrinsic properties. In spherical coordinates, you can still have a straight line and distance is still measured in a straight line, even if that would be very hard to express in numbers. 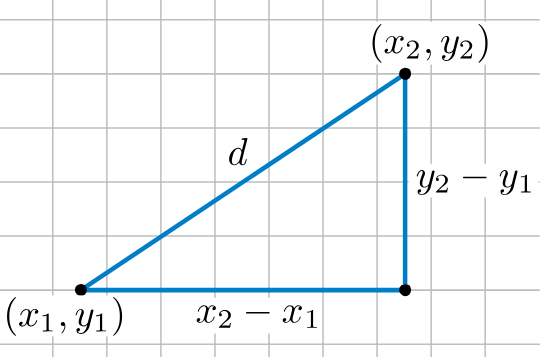 which relates to the Pythagorean theorem: a² + b² = c². Here, a and b are legs of a right triangle and c is the hypotenuse. Suppose that two points, (x₁, y₁) and (x₂, y₂), are coordinates of the endpoints of the hypotenuse. Then (x₂ - x₁)² in the distance equation corresponds to a² and (y₂ - y₁)²corresponds to b². Since c = √(a² + b²), you can see why this is just an extension of the Pythagorean theorem. The distance formula we have just seen is the standard Euclidean distance formula, but if you think about it, it can seem a bit limited. We often don't want to find just the distance between two points. Sometimes we want to calculate the distance from a point to a line or to a circle. In these cases, we first need to define what point on this line or circumference we will use for the distance calculation, and then use the distance formula that we have seen just above. Here is when the concept of perpendicular line becomes crucial. The distance between a point and a continuous object is defined via perpendicularity. From a geometrical point of view, the first step to measure the distance from one point to another, is to create a straight line between both points, and then measure the length of that segment. When we measure the distance from a point to a line, the question becomes "Which of the many possible lines should I draw?". In this case the answer is: the line from the point that is perpendicular to the first line. This distance will be zero in the case in which the point is a part of the line. For these 1D cases, we can only consider the distance between points, since the line represents the whole 1D space. This imposes restrictions on how to compute distances in some interesting geometrical instances. For example, we could redefine the concept of height of a triangle to be simply the distance from one vertex to the opposing side of the triangle. In this case, the triangle area gets also redefined in terms of distance, since the area is a function of the height of the triangle. Apart from perpendicularity, another important concept to talk about regarding distance, is the midpoint. This is the point that is precisely in the middle between the two others. The midpoint is defined as the point that is the same distance away from each of the points of reference. We can and will generalize this concept in a later section, but for now, we can limit ourselves to geometry. For example, the midpoint of any diameter in a circle or even a sphere is always the centre of said object. 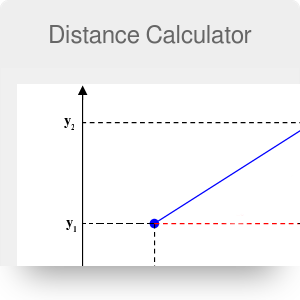 As we have mentioned before, distance can mean many things, but in this calculator, we have focused on obtaining the distance between two points in 2D space. In 2D space, points are defined by two coordinates each, and that's why the distance calculator has four text boxes for you to fill in. Using the calculator is very straightforward, but before you use it, we recommend you to get acquainted with the distance formula and its procedure (if it was the 1950 and the Internet was still not a thing). Input the values into the formula: √[(x₂ - x₁)² + (y₂ - y₁)²]. Square both quantities in parentheses. Use the distance equation to check results. which is approximately equal to 11.66. Note that when you take the square root, you will get a positive and negative values, but since you are dealing with the distance, you are only concerned with the positive result. Let's take a look of one of the applications of the distance calculator. You can use it together with the gas calculator for making road trip plans. 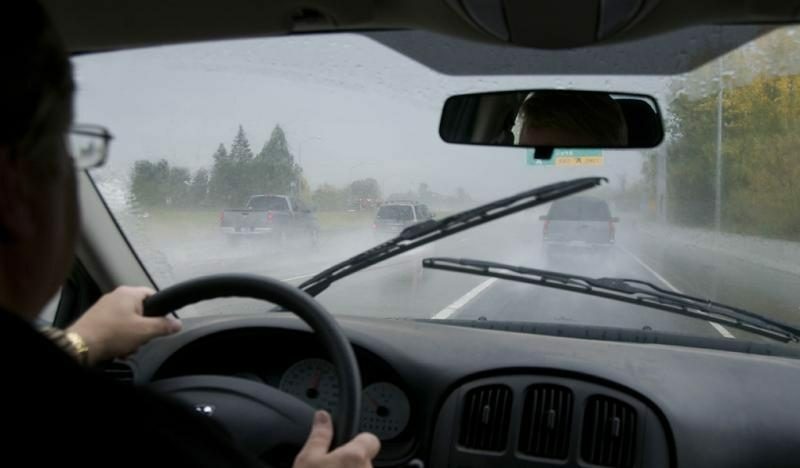 Suppose you are traveling between cities A and B, and the only stop is in city C, with a route A to B perpendicular to route B to C. We can determine the distance from A to B, and then, with the gas calculator, determine fuel cost, fuel used and cost per person while traveling. The difficulty here is to calculate the distances between cities accurately. A straight line (like what we use in this calculator) can be a good approximation, but it can be quite off if the route you're taking is not direct but takes some detour, maybe to avoid mountains or to pass by another city. In that case, just use Google maps or any other tool that calculates the distance along a path not just the distance from one point to another as the crow flies. Where our calculator can give proper measurements and predictions, is when calculating distances between objects, not the length of a path. With this in mind, there are still multiple scenarios in which you might actually be interested in the distance between objects, regardless of the path you would have to take. One such example is the distance between astronomical objects. When we look at a distance within our Earth, it is hard to go far without bumping into some problems, from the intrinsic curvature of this space (due to the Earth curvature being non-zero) to the limited maximum distance between two points on the Earth. It is because of this, and also because there is a whole universe beyond our Earth, that distances in the universe are of big interest for many people. Since we have no proper means of interplanetary traveling, let alone interstellar travels, let's focus for now on the actual Euclidean distance to some celestial objects. For example the distance from the Earth to the Sun, or the distance from the Earth to the Moon. These distances are beyond imaginable for our ape-like brains. We struggle to comprehend the size of our planet, never mind the vast, infinite universe. This is so difficult that we need to use either scientific notation or light years, as a unit of distance for such long lengths. The longest trips you can do on Earth are barely a couple thousand kilometers, while the distance from Earth to the Moon, the closest astronomical object to us, is 384,000 km. 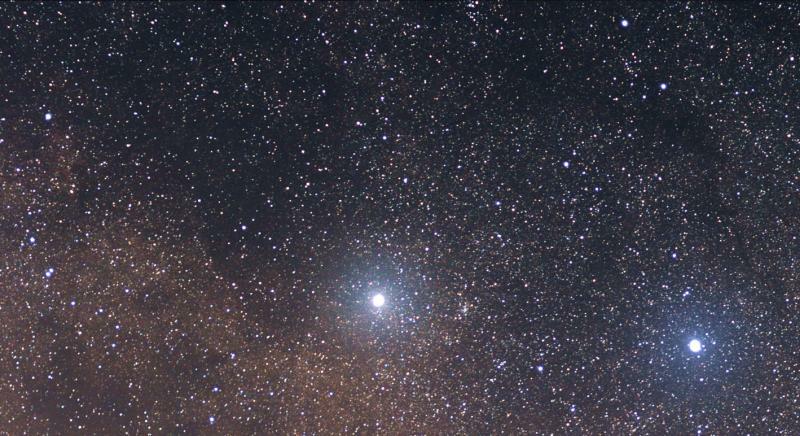 On top of that, the distance to our closest star, that is the distance from Earth to the Sun, is 150,000,000 km or a little over 8 light minutes. When you compare these distances with the distance to our second nearest star (Alpha Centauri), which is 4 light years, suddenly they start to look much smaller. If we want to go even more ridiculous in comparison we can always think about a flight from New York to Sidney, which typically takes more than 20 h and it's merely over 16,000 km, and compare it with the size of the observable universe, which is about 46,600,000,000 light years! Here, we have inadvertently risen a fascinating point, which is that we measure distances not in length but in time. Thus, we extend the notion of distance beyond its geometrical sense. We will explore this possibility in the next section as we speak about the importance and usefulness of distance beyond the purely geometrical sense. This is a very interesting path to take and is mostly inspired by the philosophical need to extend every concept to have a universal meaning, as well as from the obvious physical theory to mention, when talking about permutations of the space and time, or any other variable that can be measured. Typically, the concept of distance refers to the geometric Euclidean distance and is linked to length. However, you can extend the definition of distance to mean just the difference between two things, and then a world of possibilities opens up. Suddenly one can decide what is the best way to measure the distance between two things and put it in terms of the most useful quantity. A very simple step to take is to think about the distance between two numbers, which is nothing more than the 1D difference between these numbers. To obtain it, we simply subtract one from the other and the result would be the difference, a.k.a. the distance. We could jump from this numerical distance to, for example, difference or distance in terms of the percentage difference, which in some cases might provide a better way of comparison. We don't need to stay just with percentage, we can convert percentage to fraction if you feel that would be the best way to express distance. But so far, this is still just one level of abstraction in which we simply remove the units of measurement. But what if we were to use different units altogether? By extending the concept of distance to mean something closer to difference, we can calculate the difference between two temperatures in terms of degrees or thermal energy, or other related quantity like pressure. But we don't need to get really extreme, let's see how two points can be separated by a different distance, depending on the assumptions made. Coming back to the driving distance example, we could measure the distance of the journey in time, instead of length. In this case, we need an assumption to allow such translation; namely the way of transport. There is a big difference in the time taken to travel 10 km by plane versus the time it takes by car; or by car versus bike. Sometimes, however, the assumption is clear and implicitly agreed on, like when we measure the lightning distance in time which we then convert to length. This brings up an interesting point, that the conversion factor between distances in time and length is what we call speed or velocity (remember they are not exactly the same thing). Truth be told, this speed doesn't have to be constant as exemplified by accelerated motions such as that of a free fall under gravitational force, or the one that links stopping time and stopping distance via the breaking force and drag or, in very extreme cases, via the force of a car crash. Another place where you can find weird units of distance are in solid state physics, where the distance a particle travels inside of a material is often expressed as an average of interactions or collisions. This distance is linked to length by using the mean free path which is the mean distance (in length) a particle travels between interactions. If we want to get even more exotic we can think about the distance from the present value to the future value of something like a car. This distance between prices is linked here by the car depreciation, and it's not as cut and dry as the other distances, but only because of the number of factors involved in calculating this distance. We don't want to, however, make anyone's brain explode, so please don't think too hard about this. Just take this calculator and use it for length-based distance in 2D space. You can always return to this philosophical view on distances if you ever find yourself bored and having already checked all of our Omni Calculators. Álvaro Díez - PhD candidate, Piotr Małek and Mateusz Mucha. 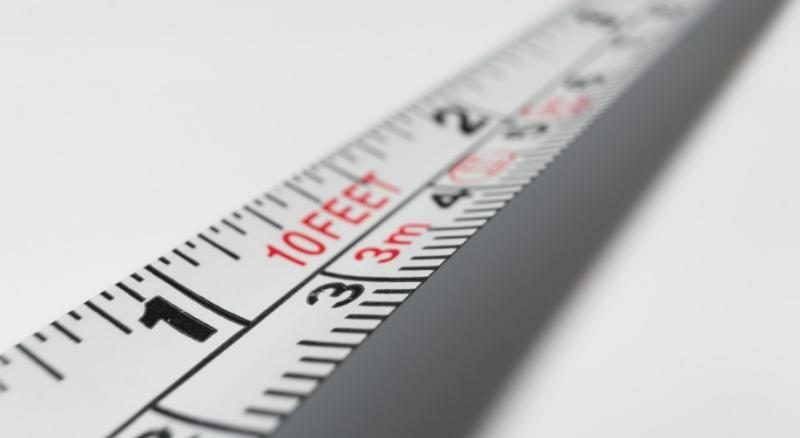 Distance Calculator can be embedded on your website to enrich the content you wrote and make it easier for your visitors to understand your message.